The chess program Shredder, brainchild of programmer Stefan Meyer-Kahlen, has won the 2010 World Computer Software Championship. The event, administered by the International Computer Games Association (ICGA), was held in Kanazawa, Japan from September 24 through October 2. It was hosted by the Japan Advanced Institute of Science and Technology. The World Computer Software Championship (WCSC) was one of several events held as part of a larger group of computer gaming events. The WCSC was open only to PC software programs (not dedicated machines); the nine participating programs ran on identical hardware platforms. The time control was G/45 with a fifteen second “Fischer” increment per move. All standard tournament chess rules applied to the event. Computer monitors were placed so that each operator could see the monitor of the opponent. The operators’ only duties were to input moves, respond to computer requests for clock information, and synchronize the computer’s clock with the official clock time of the standard (shared) timepiece. Now that White has “telegraphed” his intention to fianchetto the light-squared Bishop, Black takes the c4-pawn. As for 5.e3, advancing the pawn with the intention of playing Bxc4 makes White’s fourth move meaningless and a waste of a tempo. A very strange move from Hector, one which returns the pawn. 10…b5 is the “book” move in this position. 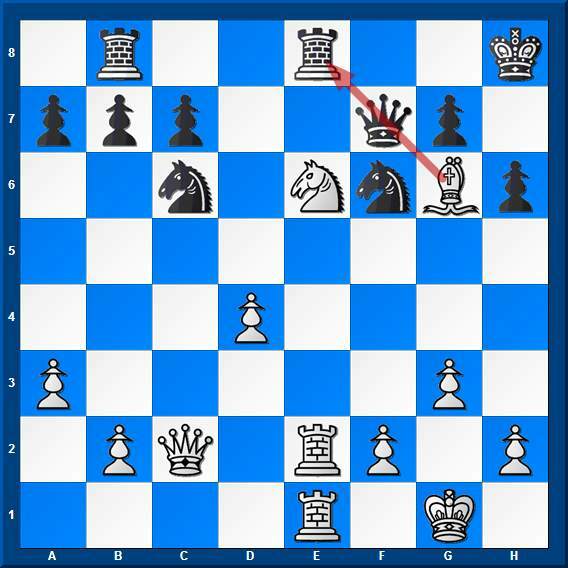 12.Qd3 is another good idea, with the intention of overprotecting the d4-pawn. This is another overprotection idea; either Knight can now swing into action even after the d4-pawn comes under attack. becomes a target on d5. Black’s Rooks are finally connected, but White’s already well into his own middlegame (as we’ll see) and is comfortably ahead positionally. seeking to prevent it by overprotecting the pawn. It’s a good idea, but it comes with strings attached: Black’s position is slowly being tied in knots. It just keeps getting uglier for Hector. The Bishop is pinned to the Queen and is itself caught in a pretty serious crossfire. Attacking the d-pawn, but this is just a futile gesture on Black’s part. If this was a human player, I’d say he’s posturing here. This is just brutal. If this was a boxing match instead of a computer chess game, the referee would be stepping in to stop it. Pinning the Queen and Rook and forcing a trade. 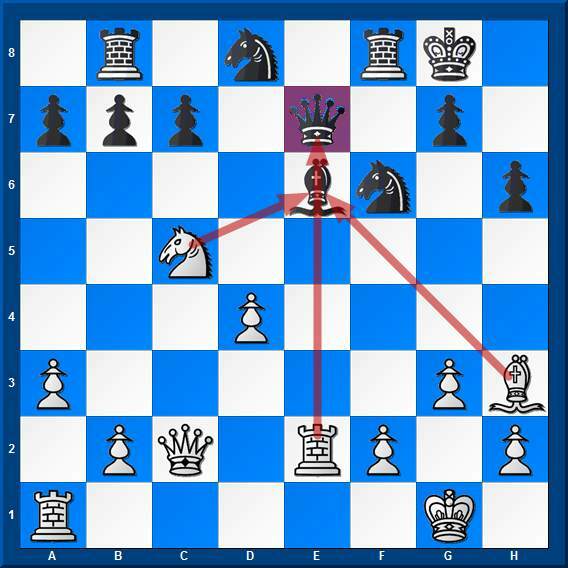 30…Qf7 would have been better; it still attacks the White Knight and doesn’t give up the initiative. Attacking the Black Queen, forcing a response, and maintaining the initiative. And we again have the threat of Qxg7#. The move 36…Ng8 was arguably better just for simplicity’s sake. Now White can’t play 40.Rxb7 because of 40…Qc8+ forking the White King and Rook, and turning the tables. This was a really nice little trap. I’m impressed with Hector for finding it and with Shredder for not falling into it. Black, unfortunately, really doesn’t have anything better here. to know what criteria Hector’s operators used to decide when to resign a game. From this point on, mate is forced no matter what Black does. Despite the fact that Black was behind for most of the contest, this was a very interesting little game; aspects of it are much more subtle than are normally seen in games contested between computer chess engines. Congratulations to Stefan Meyer-Kahlen and Shredder for a fine accomplishment in winning the 2010 World Computer Software Championship! I’m not sure I understand this contest… Specifically, Deep Junior is the only other engine I’ve even heard of..
You would need to ask them. They were the ones who chose not to participate. Rybka won both the “free for all”, and “blitz” tournaments where hardware was unrestricted. Note “Identical hardware” doesn’t equal “fair hardware”, if it was run on one core, it’s unfair for programmers that have worked to implement multicore support, if it was ran on a 8core machine, it’s unfair for the programmers that haven’t been able to program multicore support, since they don’t have the resources, or have never tested on such “big” machines, or don’t care to implement it, so it’s as if they played on hardware 8 times slower, etc. If equal hardware is what matters, then people can run such matches at their own home, and see what engines are best without having to see a championship. What makes these tourneys interesting, is knowing the highest possible level of unassisted chess is attained at those time controls, one sees the latest, strongest beta version of the programs face each other, and one can enjoy the games without wondering if one can or not get that (the same way one doesn’t wonder about if one could buy Magnus Carlsen to the computer). One can see who’s the very best possible chess entity on the planet. Limiting the hardware misses the point. Rybka chose to not participate in the identical hardware tournament. I chose to write about the identical hardware tournament. Note my previous reply was a critique of the WCSC tournament, not a critique of the article, that has a well commented game and all. My point is that I see no harm in giving credit where credit is due, in this case to Shredder, without feeling some sort of obligation to mention any of literally hundreds of other non-participatory chess engines. If people are curious about the absence of Rybka (or Fritz, or Hiarcs, or Stockfish, etc, etc.) the folks to ask are the engine’s programmers. Well, it’s sort of a bummer, reading here it seems there’s a WCCC and a WCSC and who knows now what else? If I had a good program I’D PARTICIPATE in all the world tournaments — anyhow, it would seem that Shredder has built up a good reputation and if a user like me has a “normal,” computer with just one, two, three or four cores, then Shredder is the winner. Vyrton is wrong that you can trust the rating lists. He is a Rybka Forum censor who ensures that the public is in the dark. All the rating lists he gave deliberately exclude better engines than Rybka, due to fantasy beliefs about their origin/legality, or whatever the power brokers declare. This slur was completely exploded by a long 30 page report that gave a complete analysis. Better rating lists appear at open-chess.org and a multiple of various Russian sites, which are claimed to involved in piracy so that they can be censored. Houdini is #1, and from a FIDE-rated Belgian. Rybka chose not to compete in the regular class any more, and will largely appeal to the high-tech geek crowd with oodles of disposable income who can pay for mega clusters. Vyrton is also wrong that Rybka cluster is the “best chess entity” on the planet. because the Freestyle guys can top it.. COmputer intelligence is not really here yet, and adding a good human can add 150 elo or more. The short 9 game tourneys are more about having a superior opening book, and that is where Rybka excels. This can play a major role in deciding who wins, and is one reason why the Houdini maker didn’t travel to Japan. Rondo is a new version of Zappa, developed by a guy from Texas. Thinker has been around for awhile, its a guy from Canada (Perkson?) my memory says. Jonny is some sort of academic project that can use huge hardware (800 cores), but never lives up to it. The others I don’t know either, and are hobbyists I suspect. If Rybka can’t beat these guys on equal hardware, what’s the point of it? Thanks Steve: that’s a really interesting article. 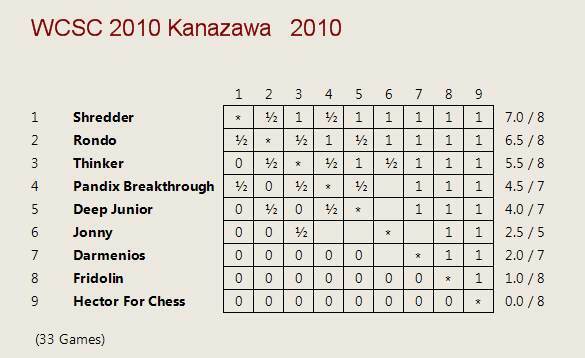 As for who enters these events: commercial programmers use computer chess tournaments as marketing tools. It therefore makes sense for them to enter their programs in events they are likely to win. It’s a shame that consumers assume the program that beats other programs most often is the best. Re: Post above…yea, it’s really a shame that people ‘assume,’ a program that beats others is the best. Next, I was going to ‘assume,’ that the NFL team with the highest rating was better than the team with the lowest. I think you might have misunderstood his point. See Trample’s post immediately above it. The fact that so many of the “big boy” commercial programs declined to participate in an event run on equal hardware is quite telling.